I wanted to keep the make-up real simple. so i went for a natural smokey look and a red lip. When i saw this lipstick from mac i knew i was in love. 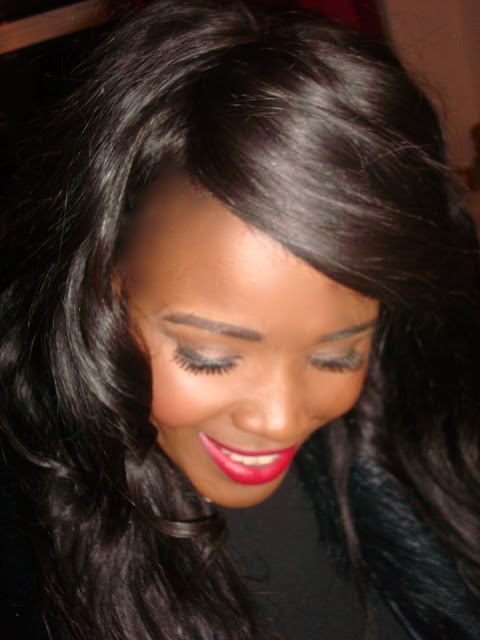 It is such a vibrate vintage red and perfect for those of you who dont like ruby woo or think its too bright. It is limited edition though so if you want it, go get it now!!!. I was surprised at its staying power as well. I applied it on .. got ready.. ate... drunk had froyo and still it stayed, so i would definitely recommend this lipstick. I wore the L'oreal true match foundation in cappuccino again and i have to say this is fast becoming a drug store favourite. It is soo blend-able, its unbelievable and as you can see it offers medium coverage.So what to you guys think of my birthday makeup.. yay or nay? P.s. Tonight i am going to a ball so stay tuned for those pictures! where does one get Elf products? you are so beautiful! thanks for your lovely comment! you look great - i really love the bright lip on you! thanks for stopping by my blog and following you back. Your make up is flawless. The bright red lips really suit your skin tone. Thank you so much for your sweet comment on our blog!!! Your make up is so pretty!!! we love your blog! you are so pretty! love the lippy that you are wearing! super cute on you. Thank you so much for the lovely comment I'm following you now hope you do the same! You are so pretty! Love that lip color on you! I'll bookmark your weblog and check once more right here regularly. I am relatively certain I'll learn lots of new stuff proper here! I've been browsing on-line greater than three hours these days, yet I never discovered any fascinating article like yours. It's lovely value enough for me.